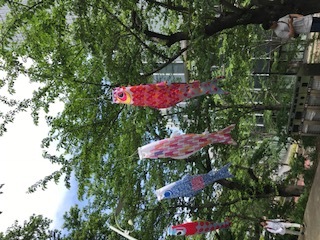 Ayako Egawa wrote to me today about a Koinobori event she went to in Japan. 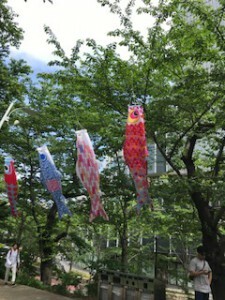 Koinobori are large carp windsocks that are displayed for Tango no Sekku (Boys Day) outside homes in Japan. 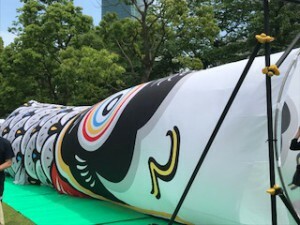 The carp is a symbol for the holiday because they’re considered strong and determined. Here’s Ayako’s note with the pics she shared. 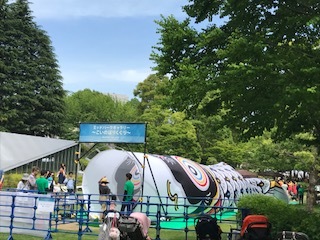 I found an event called “Art Koinobori” in the park today. 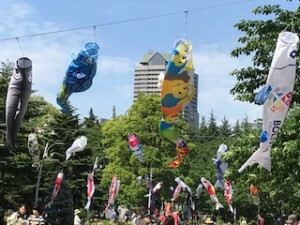 The artists created their own Koinobori and they are displayed in the air. They look modern and colorful. Also there is an big Koinobori tunnel where we can walk inside, too. Many thanks to Ayako Egawa for sharing these photos with us! This article was posted on Sunday, May 6th, 2018 at 7:57 pm	and is filed under Countries & Cultures, Japan, Japan, Mama Lisa, Photos, Photos of Places, Tango no Sekku - Japanese Boys' Festival. You can follow any responses to this entry through the RSS 2.0 feed. You can leave a response, or trackback from your own site.